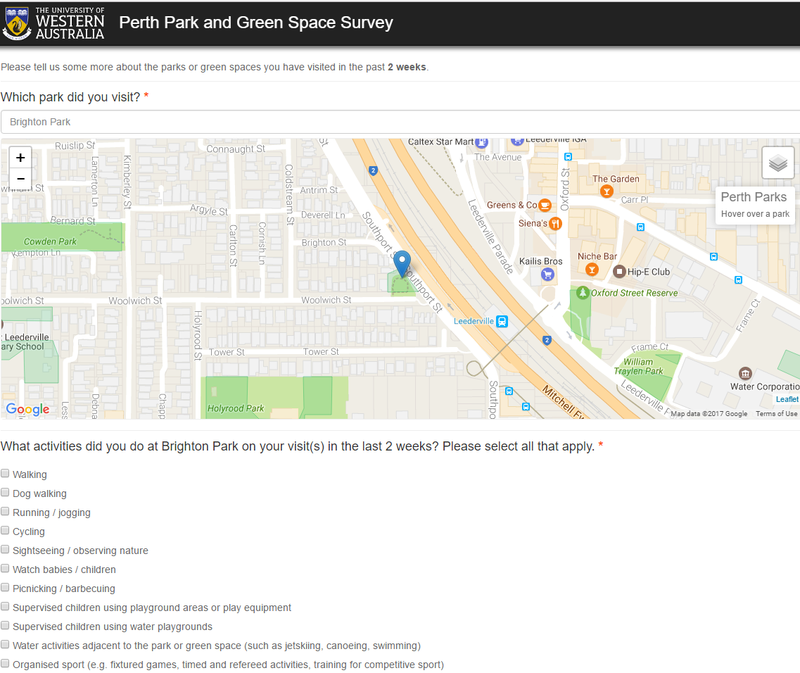 Following on from previous work we did on the Public Open Space (POS) Tool (see our project wrap up here) we have completed another web mapping and spatial project with the University of Western Australia’s Centre for the Built Environment and Health (CBEH), namely the Perth Park and Green Space Survey, which you can find running at https://survey.perthgreenspace.com.au/. This survey will ask you questions about your use of parks and green spaces (i.e., no entry fee or membership required) in your local area and around Perth. We are interested in what areas you visit and for what activities. We are currently testing our survey and require people over the age of 18 to complete the 10 minute survey at two different time points that records details of recent park use. If you agree to take part, we will ask you for your email address so that several days after first completing the survey we can contact you again and ask you to complete the survey for a second time. The purpose of this is to test our data collection methods and evaluate our survey design. The survey starts like a normal survey; it asks you to register and then sends you a “please validate your email address” email to get started. The system then assigns you to one of two groups of users – one who gets maps, and one who doesn’t. This is to support some A/B Testing that tests if the use of web maps is beneficial (and there will be some research on this in the future from CBEH). Once validated, you then put in your home address (or nearest street corner) which is then georeferenced on the first map. From here, you indicate if you’ve been to any parks in recent times, and the system then either gives you a map or an input box to pick a park, centered on your address, and then you fill out some information on your use of that park. Once you’ve filled out your details, and some demographic information, then the survey ends. And three days later, you get another email reminder to come back and fill out some more information. The team at CBEH then can hit a specific secured URL and the system will generate a data dump of the responses for them, which nicely closes the loop on the data. The system is another SurveyEngine implementation, and as part of our ongoing evolution, it’s actually been developed in serverless infrastructure, using a range of services in Amazon Web Services (AWS). This is a pretty new set of technologies (you can read more about the AWS serverless offerings here), and we’re using this in a few different areas already, like these SurveyEngine projects. We even had Ben run an internal “What is Serverless” session at our regular drinks on a recent Friday which has us all thinking about the various possibilities of this technology stack. 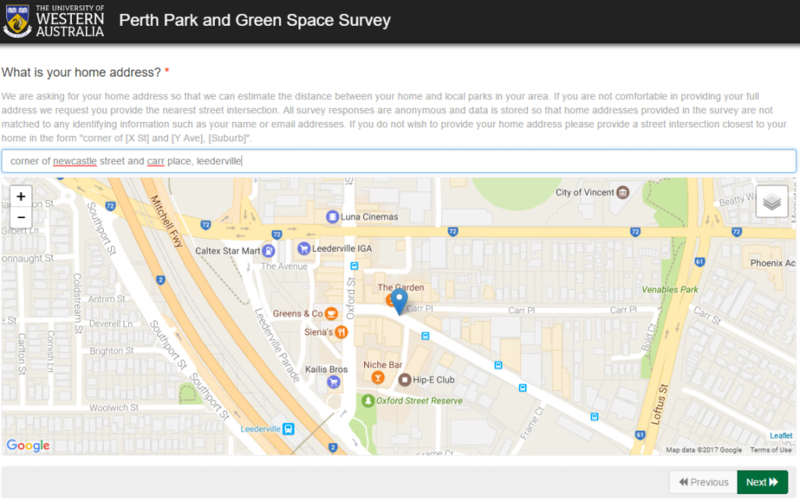 Anyway, CBEH has been up and running for some time at https://survey.perthgreenspace.com.au/ – if you live in Perth, go and record some information about your use of the parks and green spaces in your area – and go into the draw for a $250 Coles/Myer voucher! If you want to know more about how we can help you with custom mapping based surveys, or about serverless technologies, then feel free to drop me a line (andrew@gaiaresources.com.au) or start a conversation with us on Facebook, Twitter or LinkedIn.